Gain the knowledge and credentials to help your clients dramatically enhance their golf performance. This step-by-step Specialist Course provides valuable information that will help expand your marketability to golf enthusiasts who want to boost their overall game, balance, strength, flexibility and posture. This Speciality Certificate Credential focuses on exercise progressions, swing analysis, swing faults, program design and marketing to golf clients. You’ll learn about golf-specific injuries and how to identify physical limitations that could cause a player’s swing inability, plus you’ll become proficient in simple solutions to help individuals play again and gain the edge for optimum golf performance. Gain assessment knowledge for posture, muscular strength, flexibility and endurance. Discover the advantages of using a stability ball and how it improves golf performance. Understand how the body effectively produces power during the golf swing. Gain knowledge of the mechanics of the golf swing. Learn why proper conditioning can improve your clients swing. Teach clients about the relationship of strength/flexibility to the golf swing. Gain an understanding of how the body’s strengths and weaknesses affect the golf swing. Amplify knowledge of stability ball exercises to restore proper function and prepare your client for more advanced golf conditioning. Gain unique exercises utilizing the ball. Gain a strong foundation of stretches and mobility exercises for golf fitness. Review tips on how to develop an effective marketing plan, get publicity and network. Gain knowlegde on how to personalize your cleints fitness plan to meet their needs. Understand common golf related injuries, swing faults and exercises to help correct. 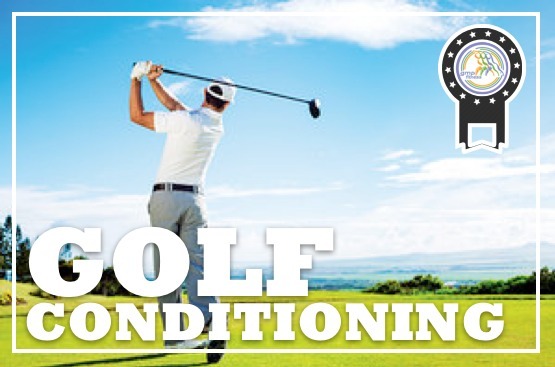 Discover how to attract new clients and become the golf conditioning expert in your area. Show clients how to strengthen driving distance and reduce the chance of lower back injury. Design effective training routines for players of all ages and abilities. ✓ 70 question online true/false and multiple/choice final exam.